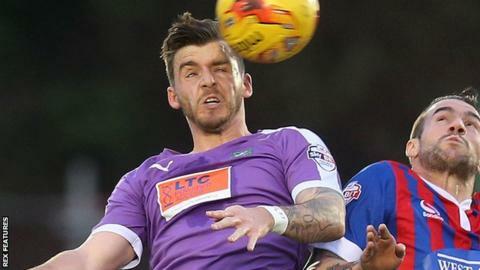 Plymouth Argyle midfielder Graham Carey says they are capable of back-to-back promotions if they go up this season. The Pilgrims are second in League Two and have a nine-point buffer between themselves and the play-off places. "The onus is on us as players to get promoted, that's the aim," he said. "We've seen teams get back-to-back promotions and there's no reason why we can't. Getting over the hurdle of the first promotion will be tough, but it's something I'm confident we can do." Argyle are in their fifth season in League Two, having suffered back-to-back relegations when the club had financial problems. "I'd like to get promoted with Argyle, it's a shame that a club this size is in League Two and now we're going in the right direction," Carey told BBC Radio Devon.. The Irish midfielder joined the Pilgrims in the summer and impressed in the first half of the season, scoring eight goals in 24 games and being the catalyst for much of the club's good play as they went top of League Two. But the former Ross County, St Mirren and Celtic player suffered a knee ligament injury at Dagenham and Redbridge at the end of November and only returned to first team action on 23 January. "It's been a frustrating two months because I was playing a lot and enjoying my football," he said. "Being out for the last two months has been frustrating, but the lads have done really well to stay where we are in the league through a tough period."